The aim of ACTUATE was to develop, test and implement advanced driver training and education concepts for safe eco-driving in the public transport sector. As previously existing eco-driving initiatives had mainly focused on diesel vehicles,there was a real void to fill by supporting the introduction of safe eco-driving trainings for clean vehicles, i.e. trams, trolleybuses and hybrid buses. In order to unlock this potential, the project put a particular focus on the drivers,as they are the pivotal element for better vehicle handling, safer performance and optimised energy savings. ACTUATE developed numerous sets of training materials, such as concepts, brochures and presentations, in order to implement comprehensive programmes for safe eco-driving. All of the training materials are available free of charge on this project website in the “Outputs” section. 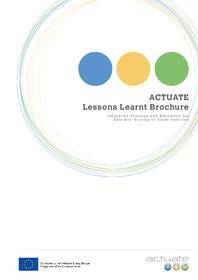 We want you to benefit from ACTUATE’s experience and therefore published a brochure that summarises the lessons learnt during the project. Please consider this brochure a helpful instructional guide for preparing, developing and implementing a safe eco-driving training programme for clean vehicles. Find out more and download the brochure below or contact Alexandra Scharzenberger for a print version. Enjoy learning about the impressive project results!